Nifty! PSG-only, but that's really all you can expect. Now you play two kinds of music. One thing I have been working on, though, is a compression scheme that allows me to fit VGMs larger than 64 kB (actually around 60 kB since i need a few k for code and data). I settled for a simple method that gives about a 30% compression ratio on typical SMS/GG VGMs, but is fast enough to decrunch on-the-fly. So that ups my song size limit to about 90 kB. I still need to tweak the timing a bit though. That's the compression you were working on for the MD player over at spritesmind, right? I really need to work that into the MD Myth player (which is just your player minus the compression). Right, but I used a different algorithm here. For MD VGMs the real space-waster is usually the DAC write commands (0x8n) that tend to occur in long sequences, but with varying values for n.
For SMS/GG VGMs the DAC is irrelevant, but you've got a lot of 0x50 0xnn commands (which writes 0xnn to the PSG) - sometimes with a wait-command shoved in between every couple of PSG writes. So what I did was to store a byte of flags for every eight commands. If the corresponding bit in the flag byte is 0 then the full command is present. If the bit is 1 then the command is implied to be 0x50 and only the 0xnn byte is present in the compressed stream. I've created a tool that converts from .VGM to .SPC. 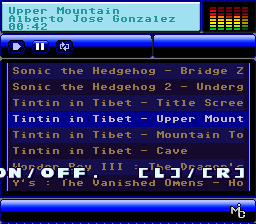 Give it a .VGM/.VGZ file and it'll spit out an .SPC file with the VGM data and my playback code. The zip also includes the SPC-700 assembly code for the player. I've updated the converter as well as the playback code, trying to improve lots of small things. The new version is available here. Use a real SNES or BSNES to run it, other emulators will likely mess the sound up. Seems like you had lots of fun coding it. The GUI code is 2000+ lines of poorly written assembly. Lots of hardcoded values/addresses, anonymous labels, and practically no comments. But it turned out ok I think. At least there are no serious bugs in it that I know of. Sounds like my dynamic animation engine. I'm trying to release the source code, but it's full of hardcoded values/addresses, no comments and different parts of the engine are in seperate places in my game's code. I've updated this project a bit lately. Here's the latest ROM, here's the latest source code, and here's a youtube video of the ROM running on a PAL SNES. *Improved the VGM compression, without any significant increase in decompression complexity. *Added 18 more songs, so there are now 50 in total. *Improved playback timing by using carefully timed code. *More accurate handling of the noise bass functionality. The previous version used an incorrect duty cycle and a gain that was way too low. *Added a few audio filters that you can switch between using Right on the D-Pad. There's the default one (no filter), echo (80ms delay), a bass boost filter (mix between the original signal, slightly attenuated, and a low pass-filtered version of itself), bass boost with delay, and treble boost (similar to the bass boost but using a high pass filter instead).